Last night was my first ever calm and relaxing new years eve, allowing me to recharge for the year to come. It was also the first new year's that I didn't spend with my family, and I missed them greatly. 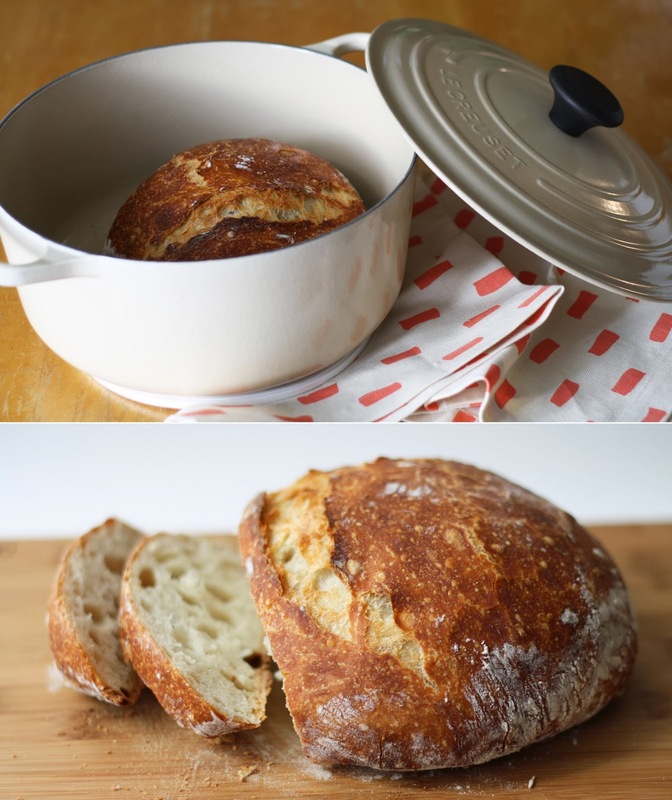 While in Morzine last March, I witnessed the making of perfect crusty bread in a dutch oven. I remembered that the dough needed to sit overnight, and since I was taking it easy last night, it seemed like the perfect thing to try...prepare the dough in 2013, bake the bread in 2014. Not only did the bread turn out so delicious, but it was also a pretty fabulous way to christen the dutch oven if you ask me. Happy 2014! Note: The recipe calls for a dutch oven. If you don't have one, you could try using anything else that can take the heat - clay pot with lid, pizza stone with a bowl to cover the bread, pyrex dish with a lid, stainless steel pot with a lid, baking dish covered with aluminum foil. Good luck! In a large mixing bowl, whisk flour, salt and yeast. Add the water and mix well. Cover the bowl with plastic wrap and let sit overnight. Preheat oven to 450. Once oven is hot, place the empty, covered, cast iron pot in the oven for 30 minutes. While the pot is heating, place the dough on a well floured surface and shape into a ball. Cover with plastic wrap and let sit until the pot is hot. Once pot it hot, place dough ball in the center and all to bake, covered for 30 minutes. Remove the lid and bake for an additional 10-15 minutes to crisp up. Remove bread from the oven and transfer to a cooling rack.